Today we have a new update on Fig. We've passed the $3 million milestone, and we're excited to debut some new storyline details, as well as some new artwork and new stretch goals! Thomas here. We have a whole bunch of odds and ends to share with you this update. The most exciting news first: we passed $3M total in funding, with two weeks to go. 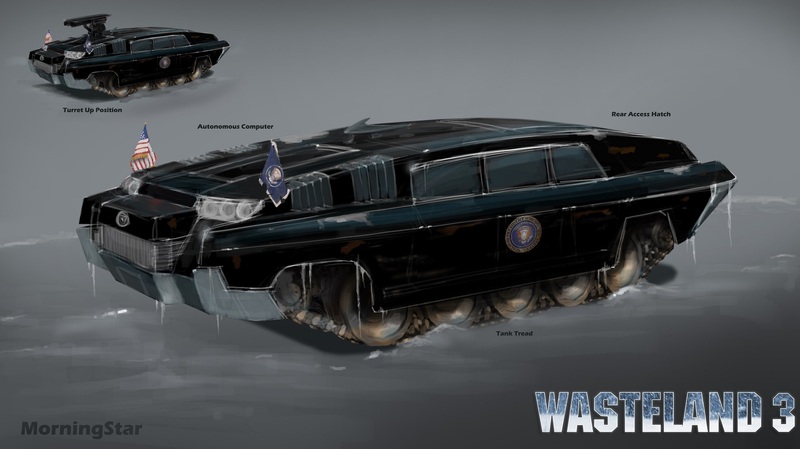 It’s an amazing milestone to pass, and it means that Morningstar, the talking car companion, will be making his commie-loathing appearance in Wasteland 3. Well done, everyone! We still have some stretch goals planned, and I’ll talk about one of those in a bit. But first, I want to formally welcome you to the Colorado Territories with a new art piece by Andrée Wallin, most recently known for his work on the film Star Wars: The Force Awakens. As you may recall, Wasteland had an iconic top-down cover art piece illustrating the game’s aesthetics, and we made a new take on it for Wasteland 2. Of course, we had to create a new version for Wasteland 3, once again highlighting the game’s unique aesthetic and themes. Ooh, magical mystery soundtrack! Will it be Bach or will it be Brexit - who can tell at this point? dorkboy wrote: Ooh, magical mystery soundtrack! Will it be Bach or will it be Brexit - who can tell at this point?